In 2019 Lady Gaga’s successful song will already be 10 years old! In 2009 the singer released the hit from the album "Fame" in Germany. It remained unbelievable 70 weeks in the charts. From poker game to love game – With many terms from the world of gambling Lady Gaga makes clear allusions with sexual references. Also in 2009 Rihanna released her single "Russian Roulette" from her fourth studio album called "Rated R". The basic attraction of Russian Roulette is that you insert a cartridge into a revolver and then turn the drum. If you then press the trigger, you don’t know whether a shot will be fired or not. You look death in the eye, so to speak. Rihanna compares this risky game with a relationship (presumably her own with Chris Brown) – probably to express that this also can end badly. This song by the Swedish pop group ABBA was released in 1980 on the album "Super Trooper". The artists sing about a woman who lost her husband to another woman. The separation is compared to the loss in gambling. Allegedly, band member Björn Ulvaeus wrote the lyrics within an hour – but that didn’t stop the success: The song reached the top ten of the charts in 21 countries. The oldest song on our list: Already in 1955 Ray Charles released his song "Blackjack" from the album "Yes, Indeed! ", which was released in 1958. Charles doesn’t sing – contrary to what you might expect – about the great success at the poker table but about a streak of bad luck. A sad song but still an absolute classic, which deserves its place on our list of the best! The song "Viva Las Vegas" was recorded in 1963 for the film "Viva Las Vegas" by George Sidney and is one of Elvis’ most famous hits. The artist sings about the gambling frenzy that grips him in Las Vegas and how he spends all night at the casino. The song still appears in numerous films and series and has been covered countless times. With all these great gambling hits, did you feel like challenging your luck? 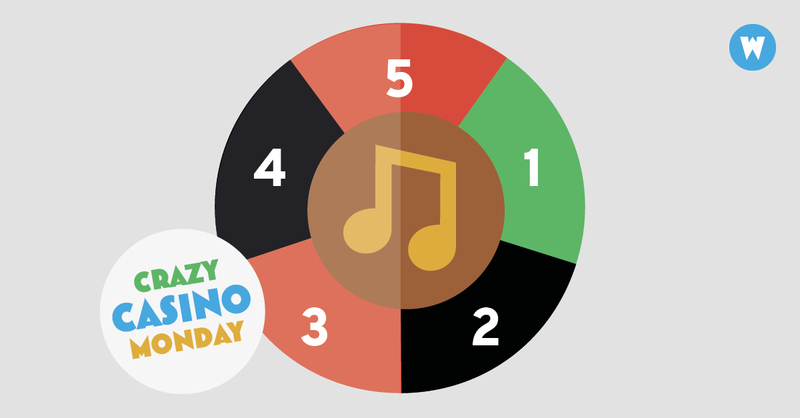 Then start right at Wunderino and get regular free spins and bonuses. And if you’re out and about: No problem! With the mobile casino in your Wunderino App, you can clear your winnings on your smartphone at any time. So, what are you waiting for? Would like to know, which casino has the highest chances of hitting the jackpot? Then have a look at our top 5 of the biggest casino wins ever.